Ever since I saw Johnny Marr & The Healers first perform live supporting Oasis at the Bolton Reebok Stadium I've had my doubts about the whole project and had my fingers crossed that maybe he will prove us all wrong and come out with an album that can truly compete with Oasis, Doves or the Charlatans on the basis that it's a great album, rather than fact that it's a Johnny Marr album. The sad truth is that despite Marr's huge influence on the current generation of rock bands, when it comes to his own solo project he really fails to deliver the goods and what were left with is an album that tries to emulate Manchester in 2003 and doesn't even come close. It would be easy to say that Johnny has never really recovered from the moment he left the Smiths and indeed Morrissey, Marr, Joyce and Rourke were a winning formula that are unlikely to ever stand in the same room together, never mind even make music together. But the fact is that after the Smiths broke up he actually went on to collaborate with a number of artists and the first two Electronic albums he recorded with Bernard Sumner of New Order truly were great albums that allowed him to break away from his trademark jingly jangly guitar sound and embrace the dance sound's he found himself listening to at the time. "Boomslang" is close in sound and texture to the 3rd Electronic album which was sorely lacking in direction and if anything was simply a statement of destroying the past completely rather than ploughing the fields he knows best. With the Healers now condensed down to three core member of Marr on guitar and vocals, Alonza Bevan (formerly of Kula Shaker) on bass and Zak Starkey (son of Ringo) on drums it's certainly less cluttered and more focused than the groove led jams we heard on the early dates, but there's still the problem of the lack of direction and originality and the lyrics which are simplistic in the extreme, but without the charm of Liam Gallaghers songwriting efforts. When he decides to strip the soundscapes down to just simplistic pop songs such as on "Down On the Corner", "Another Day" and "Something To Shout About" things somewhat improve, but throughout the whole album it's difficult to believe that you're actually listening to one of the most influential musical figures of our generation. 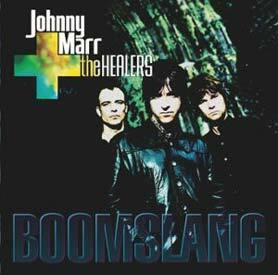 "Boomslang" proves that when Johnny is left to his own devices he simply doesn't have the objectivity to make an album of great merit. Whether it's Morrissey or Bernard Sumner to co-write with or one of his many collaborations with the Pet Shop Boys, Neil Finn or Beth Orton it's clear that he simply needs someone to bounce off and focus on. While this album is certainly a let down and one which only hard-core devotees of Marr will play regularly it's always interesting to see what he will do next. Will his collaboration with Liam Gallagher ever see the light of day? Will him and Bernard get together for another Electronic album? Or will he simply continue with the Healer and prove us all wrong with the second album?